Bullying continues to receive a lot of attention in schools and the media, and for a good reason. It takes many forms ranging from traditional, physical bullying to the more recent and harder-to-spot form called “cyberbullying”. Regardless of form or medium, it can devastate its victims and has led some children to kill themselves. It might surprise you to learn, however, that children who bully aren’t necessarily the mean kids who tower in height over everyone else and lie in wait for your child to walk by and steal his or her lunch money through sheer intimidation. Don’t fit a specific profile. Play a wide range of roles in bullying (e.g. they might actively or passively assist or encourage or a bully rather than do the bullying themselves). Can be reinforced (and, alternately, discouraged) in their bullying by parents, peers, and schools. The latter point is particularly relevant to our work at National Fatherhood Initiative. If you’re wondering whether your child is a victim of bullying or know that your child is a victim and need some guidance in how to help your child, check out these four great resources that provide definitions of and data on bullying, as well as, advice on how to deal with bullies. 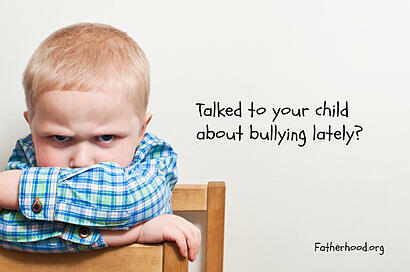 When was the last time you talked with your child about bullying?